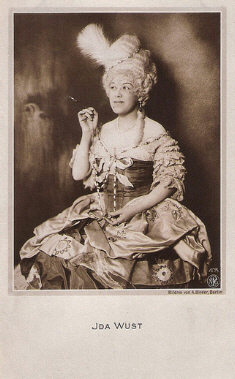 The actress Ida Wüst began her theater career at the Stadttheater Bromberg at the beginning of the 20th century, from 1904 she had an engagement in Leipzig. She got married with the famous actor Bruno Kastner and they wrote together some scripts for the movies "Nur ein Diener" (19) and "Der König von Paris" (20). Her first movie was probably "Im Rampenlicht" (12) with Max Laurence, Ernst Pittschau and Tilly Waldegg. In the movie "Tragödie der Liebe" (23) Ida Wüst played her first bigger part in a film and subsequently she became established as a player of emancipated women. To her well-known silent movies belong "Die dritte Eskadron" (26), "Unter Ausschluss der Öffentlichkeit" (27), "Venus im Frack" (27), "Feme" (27), "Der letzte Walzer" (27), "Königin Luise" (27), "Der Bettelstudent" (27), "Das brennende Herz" (29) and "Vater und Sohn" (29). She continued her successful career in the sound film era with "Drei Tage Mittelarrest" (30), "Die Firma heiratet" (30), "Bomben auf Monte Carlo" (31), "Mein Leopold" (31), "Peter Voss, der Millionendieb" (32), "Lachende Erben" (33), "Flüchtlinge" (33), "Charleys Tante" (34), "Der Biberpelz" (37) and "Zwei Welten" (39). During the war time followed only few movies like "Sieben Jahre Pech" (40), "Hauptsache glücklich" (41) and "Schuss um Mitternacht" (45). In1946 her aplication for denazification was rejected because they testified that Ida Wüst denounced other people during the Nazi time, only in 1949 she was classed as "exanorated". In the 50's she normally played cheerful middled-aged women which were very popular at that time. In the last decade of her career she took part in the movies "Es begann um Mitternacht" (50), "Eva im Frack" (50), "Ich warte auf Dich" (52), "Die Barrings" (55) and "Roter Mohn" (56).